In this article I’ll show you how to check if your iPhone or Samsung Galaxy S phone is compatible with Straight Talk’s Verizon network. If you want to sign up for Straight Talk and bring your Verizon iPhone, Verizon Galaxy S, or other smartphone, or you just prefer to use Straight Talk’s Verizon towers, you’ll need to check your phone serial number, or IMEI, on straighttalk.com. Straight Talk needs to check that your phone is compatible with the Verizon network and that it’s eligible for use with their Verizon towers before you can activate your phone. To check if your iPhone, Samsung Galaxy S, or other smartphone is compatible, visit straighttalk.com. Here you’ll need to select the carrier your phone is compatible with. Choose the Straight Talk network you want to use which in this case is Verizon. When you choose Verizon-compatible, you’ll need to check your phone’s serial number to make sure it can be used with their Verizon towers.The Verizon network uses CDMA & LTE technology. CDMA requires that each device is individually registered on the network. The Sprint network also uses CDMA & LTE technology and requires the same IMEI check . You don’t need to do this step to use Straight Talk’s AT&T or T-Mobile towers. AT&T and T-Mobile use GSM & LTE technology so registering the phone isn’t required. Enter your phone’s IMEI or MEID. The MEID or IMEI is your phone’s serial number. Dial *#06# on your phone’s dialer to find this number. You can also find it in your phone’s settings app, printed the back of your phone, or on the box your phone came it. This is a long number so enter it carefully. 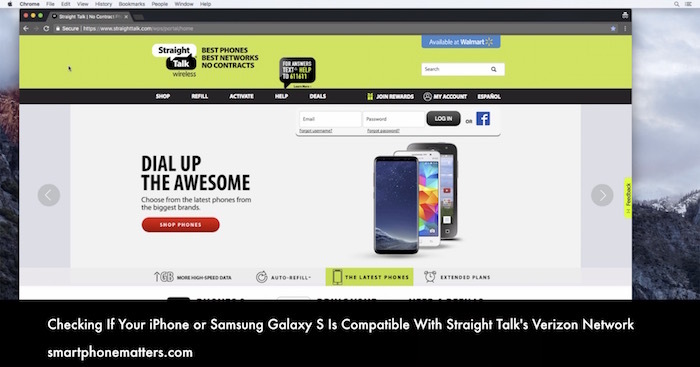 If your device is compatible with Straight Talk’s Verizon Towers, you’ll see the message, GREAT NEWS! YOU CAN BRING YOUR OWN DEVICE! Let’s activate your device now!. At the point you can continue on to activate your phone. If you haven’t done so already you’ll need to order a Straight Talk Verizon SIM for your phone before you can complete your activation. You can order the SIM on straighttalk.com, I’ll put a link in the description below. If your device is not compatible with Straight Talk’s Verizon towers, you’ll see the message, YOUR DEVICE IS NOT COMPATIBLE. Unfortunately, your device will not work with out Bring-Your-Own-Device Program. Even if you bought your phone from Verizon, were using it with Verizon service, or know for a fact that the phone is compatible with the Verizon network, Straight Talk might still say the phone is not compatible. That’s because in addition to checking if the phone is technically compatible with the Verizon network, they also check if the phone is eligible. Straight Talk doesn’t provide a list of eligibility requirements but if your phone is still on a contract or payment plan, has been reported lost or stolen, or was used with a delinquent account the phone will not be eligible. If none of the above conditions are true for your phone, you can contact Straight Talk customer service and ask them to check the IMEI of your phone again to see if it’s compatible. If none of the above conditions are true for your phone, Contact Straight Talk customer service and ask them to double check your phone’s IMEI again. Sometimes your phone is eligible but straighttalk.com reports the wrong results. If you find out your phone is not compatible with Straight Talk’s Verizon network, you may still be able to use it with either Straight Talk’s AT&T or T-Mobile network. Your phone will need to be compatible with those networks but many iPhone and Samsung Galaxy S models are. Also note that the AT&T or T-Mobile network will need to have coverage in the areas you plan to use your phone. Finally, I prepared this video for January 2018 so some of the exact steps on straighttalk.com may have changed. If you have any comments or questions, leave a reply below and I’ll try to answer them.